Tribes has been sending travellers to Tanzania since 1998 and we know it really well. We appreciate feedback from our clients whether it’s good or bad(thankfully it’s nearly always excellent!). We publish all the reviews we receive on our website. Below a some of the ‘Overall Comment’ from our travellers who’ve completed the feedback for us. We hope this helps you get a better view of whether to trust us with your holiday. Please click on the names for the full review from that client. We’d love to hear from you if you would like our help to plan a trip to Tanzania. "Because we weren't sold a package and our holiday was tailor made for us it made such a difference. The information and advices were spot on !!! " "Everything about my trip to Tanzania was wonderful and went way beyond my expectations. " "Tanzania / Zanzibar offer a great combination of safaris and beach resorts. " "Well coordinated apart from one blip. Great balance apart from our last destination, but that was our suggestion to stay an extra night." "Hi Amanda -had a fabulous time. Moshi was a pleasant place to spend a few days at a conference, felt safe and had good restaurants. The safari bit was really great -we saw everything we had hoped to see and more. There were several long drives between the various venues - but that comes with the territory - and there was always something interesting to see near the roadside or fabulous scenery..."
"Excellent Holidays. Yes Certainly as expected . In particular Safari experienced turned out to be better than expected. All in All very good holidays. Well planned and executed." "We were spoiled with wildlife spectacles, warm people encounters, great food and accommodation, and a real treat of a holiday." "Our holiday definitely lived up to our expectations. We didn't expect to see so many animals and our guides really helped make this possible. We thought 10 days was perfect in order to see and study the animals in depth. Every day we saw something new. We were a little worried as we have never had an organised holiday but it was perfect. We were lucky that the three of us were alone in our truck most days. " "We had a wonderful time! The safari was brilliant - we saw more than we’d expected. It was amazing to get so close to a pride of lions! The beach stay on Zanzibar was also outstanding. A beautiful spot with lovely staff. Thank you for arranging such a brilliant, exciting, fascinating holiday for us!" "My son and I felt our trip was better than we could ever dream of! The variety was amazing! The animals were astounding!" "All the arrangements worked fine except for a slight hitch on arrival at Zanzibar airport. Thought Nature Discovery were good. Liked safari vehicle, well designed and well thought out, padding round hatches, cushions on seats. Water dispenser. Plenty of room for the 7 of us." "The safari was amazing and exceeded our expectations in every way, including the lodges, staff and food." "More than lived up to our expectations - it was fabulous! It was expensive but worth it!" "I don't know enough superlatives to express our enjoyment! Unusually, even my husband didn't want the holiday to finish. Each location had its particular charm and special moments, so we felt very fortunate." "Amazed at the history of Stonetown. See below"
"We had an amazing time and the holiday exceeded our expectations. " " Wonderful experience. Saw so many interesting/amazing/delightful things, and learnt so much local history. I really enjoyed the variety of hotel/lodges/camps. " "The programme that Christine put together for us was exactly what we wanted & we have already sent some thoughts to her so there may be some duplication of messages within Tribes!" "The package was exactly what we wanted"
"We have had the most wonderful time in Tanzania. Everyone was welcoming and friendly and proud of their country." "Generally v good. the proposed plans were detailed and gave a relatively realistic idea of what we were heading for with one exception (Stonetown). Ruaha exceeded expectations. " "Would have been excellent but for flights. We loved the safari- getting there and back and between camps was gruelling so we wont go again until there are direct flights for the long haul and we can afford 1st class and internally we can use Coastal or private!" "We'd wanted a family 'holiday of a lifetime', and it certainly was! We combined a safari experience in Selous with the sights of Zanzibar. We came away with thousands of photos and plenty of memories." 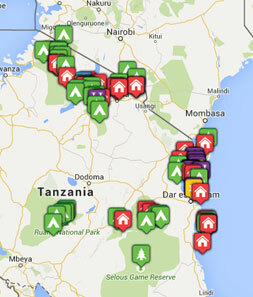 "Wonderful arrangements, great support, extremely nice and friendly people in Tanzania. " "Well organised visit sadly let down by KLM bumping our Amsterdam connection to Manchester by 6 hours "
"The accommodation was excellent, the staff were brilliant. The only reason this trip did not live up to expectations was not due to Tribes but the fact that there was a drought and therefore we did not get to see the migration herds which we had particularly gone to see." "A perfect holiday. I can't think of enough superlatives to describe it, but everything surpassed our expectations." "This was a great holiday - one of our best ever." "It was an amazing experience. We loved the country and the people we met were so friendly and welcoming. We saw some wonderful wildlife and enjoyed watching them in their natural habitat. Would thoroughly recommend the safari experience. We had been to Zambia 5 years ago and had a 3 night safari which was wonderful and I did wonder whether Tanzania would be as good but it definitely was! " "We had an excellent time Everything went very smoothly." "My second trip to Sable Mountain Lodge was just as impressive as the first. Stunning views from tent no 9 over the Beho Beho hills and the luxury of a shower under stars. As before excellent food and attentive professional service. Game drives in a rather wet and muddy Selous, but we saw all sorts of animals, except lions and wild dogs giving us a good excuse to return....If we needed one. The Selous is a magical place and Sable Mountain a superb choice just outside Matambwe Gate. I found myself welling up as we left after 4 nights. We must return. The train journey from Dar to Kisaki was a fabulous experience. The 4 hours delay would have grated in UK, but we were on holiday and enjoyed passing the time hearing the experiences of our fellow travellet's. Arriving at Kisaki at night is like a scene from an exotic fable. Butiama Beach on Mafia Island was our next stop. Beautifully laid out, it may not feel as remote as Sable Mountain but the rooms were beautiful with lovely little touches such as the kikois and beach basket. The beach was seaweed, but what does that matter. We admired the tireless work of the gardeners raking the seaweed off the beach (which is a fine stretch of white sand) every morning. Superb food! What really impresses here and sets this place apart is the fantastic service from Maura, Moez and the team. Nothing is too much for them. When I got sunburn snorkeling out came some fresh cool aloe Vera leaves which gave some relief. My partner who was unfortunately unwell one day was so well looked after. The activities are also very well planned and good value. Overall we were a bit unlucky with the weather, tropical storms, but although we understand that there were considerable problems in some of the Selous lodges, the storms did not detract from our enjoyment and actually added an interesting element to the holiday." "Since I have used Tribes to organise the previous three trips I have made to Tanzania, their expertise is taken for granted. However this year the rains in the region were unprecedented and arrangements made, had to be remade on hours notice. Christine managed it brilliantly and the whole trip went swimmingly - appropriately, given the amount of water there was about. " "Looking through our safari photo's today I had problems expressing myself as the excitement and wonder we experienced while on safari came flooding back"
"We couldn't have asked for a better honeymoon, it was definitely a once in a lifetime experience! We may have been lucky with some of the experiences on safari but they were just the icing on the cake, we had a great time and Having gone based on Amanda's recommendation we can't thank her enough for making our honeymoon such a memorable experience - thank you!" "When we decided we wanted to go on safari, we knew that we wanted to go Selous and it really didn't disappoint. The Azura Selous was a fantastic lodge and very remote - we were quite a way away from the area that the majority of lodges in Selous are located and we barely saw another vehicle when we were out on drives. " "It was a fantastic experience from start to finish! We can't wait to go back and explore more of Africa." "Everything we'd hoped for and then some. Everything ran like clockwork; the people we met were friendly, professional, on-the-ball. We're glad we went for the grand sweep across N Tanzania - the variety of habitats and wildlife made it all the more interesting." "Felt sure that planning my trip to Southern Tanzania with Tribes would be a pleasure. I was not disappointed. " "Even better than last year! Saw everything we wanted and more!" "A really good holiday just missing out on the excellent ranking, due to a slight disappointment with the Dhow Palace and an underwhelming start to the holiday." "This holiday went above and beyond everything we could have imagined." "We are still reliving our amazing holiday through our many photos (thousands). We were extremely impressed with the care that was taken to match our requirements with our actual experiences. The holiday exceeded expectations! " "All in all a super trip, but I now need a little lie down. Tanzania is a very full on safari experience, but incredibly rewarding for anybody who is prepared to be a bit forgiving. The people are charming and have a great sense of humour, and thrilled if you tell them how lovely the country is . It needs more visitors - we in the West ask a lot from the Africans to care and manage the heritage of their wildlife, but we have to realize that it comes for them at a huge cost â€“ in not many parts of the world do the major tourist attractions (think British Museum and Buckingham Palace) destroy your crops and eat you, so we have a duty to support them as much as we can. General misinformation is also to blame for the current dearth of visitors â€“ apparently the Ebola scare has decimated the numbers despite the fact that Tanzania is at less risk of an outbreak than Europe. " "The holiday exceeded expectations except the travel to and from Saadani, which was a nightmare! " "Please see my TripAdvisor reviews on Paje Dive Centre and Unguja Lodge to support this excellent rating." "It was excellent in terms of customer service, accommodation and food. The wildlife was rather more shy than we have experienced elsewhere which was disappointing but we enjoyed it all the same. The guides too were outstanding throughout." "As close to a perfect safari as I think you could ever get. Please thank everybody concerned both in the UK and Tanzania for making this totally unforgettable - we have 2500 photos and 90 videos to prove it..."
"Absolutely the most memorable holiday ever! Not only did we have a fabulous time and incredible experiences, we were so well looked after while we were there. From start to end, a litany of \"firsts\" and they will stay with us for ever." "The information and details supplied beforehand were very informative and realistic. The only comment of note would be the location of the Slipway Hotel - it took nearly 2 hours to get there from the airport, arriving at about 4am which gave us about 2.5 hours sleep before we were picked up again for our onward flight. But, at least we had a bed! We actually had a longer wait (7.5 hours) at Dar es Salam international airport before our homeward flight departed. Power cuts, no facilities and no way to check our luggage meant a long and sometimes dark and tedious experience. For future travellers, maybe you could include a dinner and tour of Dar to help pass the hours before the flight. " "My friend and I had a truly wonderful holiday. The slight glitch in return dates became a lovely ending to our adventures. All the information and photos suppled in advance was an accurate representative of what to expect." "For over 35 years I had wanted to go on a safari and finally my eldest daughter and I booked the holiday of my dreams. Although I didn't really know what to expect we had the most amazing time which far surpassed anything I could have imagined." "Overall it was well thought out and flowed seamlessly from one camp to the next. The reception at each camp was welcoming and accommodating. The meals were varied, well prepared and presented. The accommodations were spotless, although we did have the occasional visitor, totally harmless spider and cricket! The game drives were varied and timed to suit us. Both the driver,Godson, and the guide, Maulidi, at Mdonya River Camp were very knowledgable about wildlife and birds and did their utmost to provide us with the best viewing of fauna and flora. The manager, Mary, was always available for advice and/or assistance." "It was a good experience, and we got to see some wonderful animals at very close quarters. It was hard not being able to walk anywhere by oneself - I like to go birding and to explore on foot - but I understand that this could be dangerous because of the the animals. The so-called fly camp was the biggest disappointment, as it in no way lived up to the advertisement, but compensation for this is already being dealt with by Tribes Travel, so thank you for the quick response to our concerns on this point. " "Exceeded expectations in every way. A once in a lifetime experience. " "Being new to this sort of holiday I didn\'t know what to expect but it was amazing. My husband was also very impressed having done safaris before." "from being picked up at Niarobi to being dropped back off we never had to worry about a thing,our experience was out of this world and can not think of any way we could have improved it. Saw the most wonderful sights ,stayed in diverse accommodation which were all excellent for different reasons different reasons, a holiday of a life time." "The holiday was quite superb and the arrangements all worked like clockwork. There was not a single hitch - apart from no dinner on the first night but all uphill after that!" "Having never undertaken a safari holiday before we were unsure what to expect, but we certainly were not disappointed. The abundance and variety of wildlife was amazing. We met some great people along the way too, both fellow travellers and camp/hotel staff. Everyone was really friendly and nothing was too much trouble for the staff - Hakuna Matata with broad smiles all the time!" "Selous and Ruaha were much the same as I expected (unsurprisingly) and the welcome back from the staff was warm and genuine. Mary in Ruaha and Phil and Tracy in Selous were extremely helpful and caring. " "Our driver Joyful was fantastic - incredibly well informed about animals and birds. It made all the difference having a jeep to ourselves." "We had high expectations but these were surpassed in terms of the quality of accommodation, cultural visits to the tribes, knowledge and friendliness of the guides, quality and quantity of the wildlife and varios habitats. Superb"
"Best holiday ever. All our internal travel went smoothly which is quite something for Africa. Everything that Tribes promised us happened and exceeded our expectations." "We both lead busy lives and left all the organising in Tribes hands and they looked after every element perfectly. They listened carefully to our needs and our budget and tailored the perfect holiday for us. " "We have learned through the years that expectations can ruin what might otherwise be a wonderful experience. However, it is impossible not to have them. I would say this holiday, in many ways did not "live up" to our expectations, but that is not to say that we were not extremely satisfied with it." "To visit Africa was a long time dream of ours and both Tanzania and Zanzibar exceeded our expectations from start to finish. The quality of our experiences though out were second to none with the people organising us never faltering. In a country where so many things could go wrong nothing was too much trouble; our guide made our enjoyment his priority. Never did we expect to get so close to both the wild life or the Massai people in such a safe environment created by our guide in Tanzania and hotel management in Zanzibar. Truly memorable experience." "People everywhere were friendly and efficient and did their best to ensure we had a good time. Food in general was very good and varied. Opportunity to sample local dishes as well as international cuisine. All freshly cooked. Accommodation varied from luxury tent, to historic house in the Ottoman style, to beach hut. All ideal for the environments we were in at the time. Showers varied from warm, high pressure (beach hut), through cool, medium pressure (tent) to warm trickle (Stone Town hotel) "
"It exceeded our expectations - a wonderful trip to the roof of Africa." "Well paced,very enjoyable Safari with a great selection of accommodation - more than lived up to our expectations. Tanzania a beautiful country." "The safari element really lived up to our expectations, but Zanzibar was a little disappointing, especially the very run down state of Stone Town when our duaghter had told us how much she'd liked it; I think her memories are out of date! If I'd known there were such strong winds in the NE I would have chosen to stay elsewhere." "This is our fourth holiday with Tribes, and as usual everything was perfectly planned." "We had a truly wonderful time. We didnâ€™t really know what to expect but it was better than either of us could have imagined. Your recommendations were spot on." "It was a great mix of relaxing and more active activities. The great thing is that we didn't see another tourist until we got to Zanzibar. Unlike other parks, we did not circle around animals with ten cars at the same time. We had the whole experience to ourselves. " "From the initial introductions, through deciding on locations and accomodation, to the booking and the actual experience..the service provided by Tribes was 5*"
"very happy overall; we did not encounter any difficulties"
"The trip was amazing, and everything ran smoothly from the planning process through to arriving home at the end of our honeymoon. A massive thanks to everyone at Tribes and the local suppliers who did so much to make sure everything was perfect." "Tribes was an excellent co. to travel with. Tracy booked the whole trip just as we wanted. " "I think that Tribes has an extraordinary infrastructure and everything was dealt with impeccably. Many thanks! We will now book all our holidays through you!" "Great holiday for a party of four adults." "Our expectations of this trip after an earlier one to India to see tigers were very high - however our expectations were exceeded beyond measure!" "The trip exceeded all our expectations. Travelling to remote destinations enables game watching to be conducted at leisure without lots of other vehicles invading your space." "Overall the holiday was very good. Transport arrangements were good, overnight accommodation was mostly good, food was better than we expected. Most important of all the animals were brilliant." "We were extremely satisfied with all aspects of the holiday and we are very grateful for all the effort put into by all concerned." "We had a great time and would return !" "We were very pleased with all the camps. The managers and staff were all very friendly and professional, and really looked after you, also suggesting the best ways to make the most of your stay." "The trip went smoothly. We had no problems with organisation in the Uk or on the ground. The staff at all locations were well-trained, very polite and (with particular thanks to Tara and David at Sadani) really took care of us." "The holiday was just magical and all choices and recommendations were spot on. The experience of a lifetime." "In several areas the holiday was excellent but was let down by one or two poorer locations"
"I'd go again with Tribes without delay!" "The holiday exceeded expectations in every aspect. The accommodation booked matched our requirements exactly and the logistics of the travel worked perfectly." "Our tour organisede by Tribes in Tanzania was most enjoyable and totally trouble-free"
"A fantastic holiday that exceeded expectations in all areas!" "All arrangements were first class"
"We had a terrific holiday: from the initial organisation by Hannah to the quality of the hotels, the travel arrangements, it all worked very well." "Brilliant holidays. Loved the whole experience." "We had an amazing time it went beyond our expectations, our guide Elias in my husbands words is 'The King of the Serengeti' we saw the big 5 but also so much more he made our trip so very memorable big thankyou to Elias!" "The experience was amazing, and everything very well organised." "Enjoyed the flexibility of having our own driver and vehicle"
"A great holiday and one we will remember always as being one of the best." "Well organised trek and all staff concerned very well trained"
"A good trip, a memorable trip, but not a great trip, falling someway short from expectation. We were unlucky with the weather, and you cannot control that, but the choice of Lemala Tented Camp was unfortunate. " "The entire experience ran without a hitch." "Thank you for organising a superb holiday. Everything ran like clockwork. " "partly excellent (safari, accomodation, general organization of trip), partly poor (sea cliff hotel, trip to udzungwa mountain national park)"
"Will definately go to Tanzania again." "Excellent - all the parts of the experience worked seamlessly." "It was great, especially the stay at Sand Rivers was excellent in every way!" "One or two minor glitches but easily sorted out"
"Our guide was knowledgeable, entertaining and understood what we wanted. The accommodations were excellent and...great service, great food, great wine, in the most unbelievably awesome setting. " "Really well organised - everything went like clockwork. A holiday of a lifetime - we saw so many animals in 2 very different settings. Hannah really listened to what we wanted and gave it to us and more!" "An amazing holiday for our family - both parents and teenagers! " "It was a great experience of two different worlds - the plains of the Serengeti and other parks compared with the beaches and sights of Zanzibar. " "The holiday lived up to all our expectations. It was great." "Fantastic - a real adventure." "Amazing trip extremely well organised and professionally run." "Absolutely wonderful. Cannot speak highly enough of the staff at Xakanaxa, Kwara and Lebala camps." "Perfect! Memorable. A BIG thank you to Julie and the team. With thanks, Wilf." "It was a once in a lifetime and fantastic experience and also the hardest thing I have EVER done! "